I wanted to share a life update, because, my friends, it's been far too long! 1. I am in Las Vegas working at Zappos! It's such a great company and every single day I remember how blessed I am to have this opportunity. Buying and merchandising is really exciting, especially around the holiday time. And my team at 6pm.com is absolutely amazing. As the holidays approach, don't forget to shop at vip.zappos.com and our value channel, www.6pm.com (really great deals and closeout prices)! 2. I was sent Light Up Lip Gloss to try-- by Artistry cosmetics! I tried two colors: champagne and glitz. I loved them both for fall. Artistry also has great skin care products with legit science behind them. I am lucky enough to know one of the marketing partners for Artistry, Chase Holder, and he was sweet enough to send me samples. The best part? 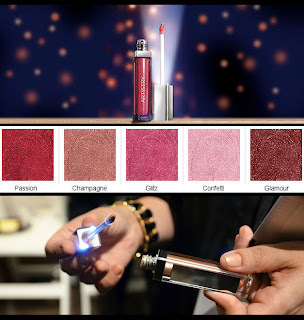 Every time you open the tube a light comes on-- perfect for getting that lip gloss poppin' when you're out on the town! 3. I tried Bikram Yoga. I realized what I've been missing-- dizzy spells, intense dehydration, and sweat flowing from your pores, all while crammed into a room full of bacteria and body odor. I'm totally getting a membership.. NOT. While I'll admit I felt great the next day, I would rather do 60 minutes of cardio at a gym than 90 minutes of hell yoga. 4. Halloween is just around the corner! I'm relieved because then I will be able to stop buying candy corn pumpkins (my October addiction), and start buying fall candles (my much-healthier November addiction). We're dressing up on a few different occasions for the holiday....New York sports teams, 1920s Prohibition/Bootlegger, and zoo animals. 5. My mom is coming to visit! I haven't seen my mom since I moved to Las Vegas in July, and I totally miss her. I am excited to show her my new world. And coming from Minnesota, I think she's going to lovelovelove our 80+ degree days.